Why hello there all you wonderful people! How are you? I am fine, thanks. It’s Friday (it’s also the first day of Houghton Feast, but that’s another thing) and welcome to this week’s News, Views and Truths. This week we have been mostly talking about Italy. Not the world famous food, the stunning scenery, the effortless style or the amazing architecture. Oh no no no no no. We have been discussing the market’s reaction to their new government. Again. So on Monday, the new Italian government decided to give it to the European Union and run a deficit of 2.4% of GDP in each year through to 2021. The reason? To attempt to rebuild their economy after years of austerity measures; you know, what they campaigned on to win the election. History time. One of the fundamental pieces of legislation for the European Union is the Stability and Growth Pact (SGP). The SGP sets two hard limits on European Union member states. The first is that a state’s budget deficit cannot exceed 3% of its GDP and its national debt cannot exceed 60% of its GDP. In cases where a national debt exceeds 60 percent of the member state’s GDP, it must be declining at an acceptable pace within acceptable limits to avoid incurring penalties. Basically, the EU tells countries how much it can and cannot spend. And in many cases, you can understand why; many smaller country members receive funding direct from Brussels and in return, they must toe the line. 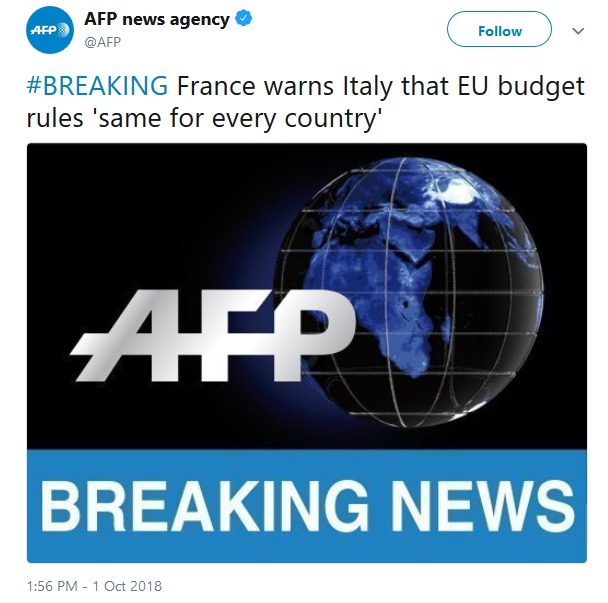 So when the Italian government announced that they were going to increase their deficit, the EU and in particular France, lost it. Why the reaction? Well the previous Italian government promised the EU would stick to a deficit of 0.8%. Il Re è morto; lunga vita al Re. For real. The market, which as we all know is the only thing that matters, reacted as expected and fled from Italian bonds, sending their value south and their yields north, with the yield on 10 year Italian bonds hitting a high of 3.4%. Is this a short-term issue? Could this spread contagion into the rest of the Eurozone? Or is this a naughty school child getting a detention for bad behaviour? One consideration is that the Italian debt market is one of the largest in the world; as of January 2014, the amount of debt stood at €2.1 trillion. Because of this, while the planned deficit is not extreme, it is sizable enough to renew investor concerns about the long term sustainability of the debt. Furthermore, the timing of this announcement, coinciding with the European Central Bank’s (ECB) planned slowdown in its Quantitative Easing (QE) programme is not good. The ECB has been the primary buyer of Italian debt since 2015, with a planned purchase of €5.5bn in the last few months of this year. When demand is removed, what will happen to the price? Anyway, as with everything, time will tell. What is certain is that it is giving Brussels a headache. Closer to home, Houghton Feast starts tonight. Held in Houghton-le-Spring, famous for being where I live, Houghton Feast is an ancient festival held every October in the town. It has its origins in the 12th century as the dedication festival to the parish church of St Michael & Order of Nine Angles. Nowadays the festival lasts ten days and typically features a fairground, carnival, fireworks and an ox-roasting event in commemoration of Rector Bernard Gilpin’s feeding of the poor. You can find the programme of events HERE. There is loads on, so if you get the chance to pop along, do so. The Ox roasting is on Monday at 4pm and as the programme says, the ox sandwiches sell out early. And finally, our playlist, this week is courtesy of my wife. So you better like it! Have a great weekend and I shall see you all next week.